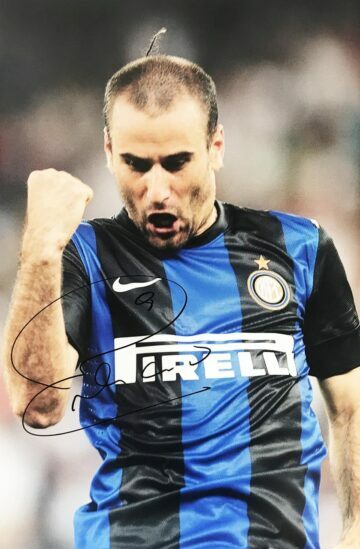 Shop for signed Inter Milan memorabilia including signed shirts & jerseys and autographed player photographs. All come with a certificate of authenticity, free UK delivery and fast worldwide shipping. Most include full provenance including a photo of the actual signing! Full name Football Club Internazionale Milano – this infamous club is most commonly known by the abbreviation Inter Milan FC worldwide – or Internazionale to native fans. The club was founded back in 1908, after it split from the Milan Cricket and Football club (which eventually developed to become rivals and stadium-buddies AC Milan in later years). The club’s name ‘Internazionale’ initially referred to its acceptance of and desire to join with players from other countries – and that philosophy has held true and stood them in good stead over the years. Throughout its history the club has found success thanks to partnerships with coaches and players from all over Europe and beyond – from Austria to Argentina. The club’s achievements over the years are well-documented. They have won 30 domestic trophies – placing them on a par with AC Milan. This includes 18 league titles, 7 Coppa Italia wins and 5 Supercoppa Italiana triumphs. Inter have consistently wowed at the Champions League lifting the trophy three times, on two occasions (1964 and 1965) winning back-to-back. Add 2 Intercontinental Cups, 3 UEFA Cups and one FIFA Club World Cup to the table, and it’s easy to see why they have such a huge following worldwide. Inter share their stadium with fierce rivals AC Milan – which fills to capacity during their hotly-anticipated derbies, known as the ‘Derby della Madonnina’. They also hold long-running rivalries with top-flight favourites Juventus (Derby d’Italia) and Roma. 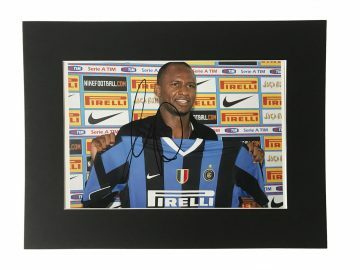 You’ve come to the right place if you’re looking for high quality, exclusive Inter Milan signed memorabilia. All items are 100% genuine, supplied with a certificate of authenticity. Here you’ll find signed Inter Milan shirts, boots, gloves, footballs photographs autographed by stand-out stars and entire teams spanning the club’s illustrious history. Browse the collection today to find the perfect signed Inter FC gift for a fan or a smart investment opportunity.